This vanity light will update your home with its eye-catching design. 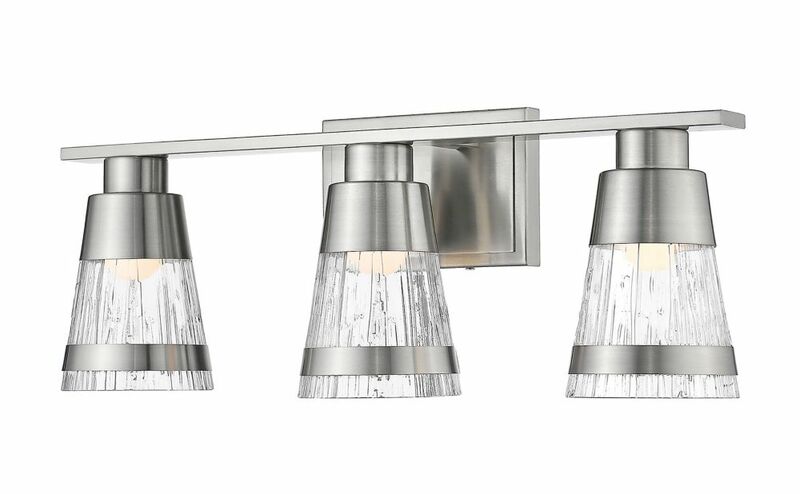 Featuring a brushed nickel finish and chisel shade(s), this fixture will accommodate a variety of dicor styles. With its easy installation and low upkeep requirements, this vanity light will not disappoint. This vanity light will update your home with its eye-catching design. Featuring a chrome finish and clear shade(s), this fixture will accommodate a variety of dicor styles. With its easy installation and low upkeep requirements, this vanity light will not disappoint. This vanity light will update your home with its eye-catching design. Featuring a bronze finish and clear seedy shade(s), this fixture will accommodate a variety of dicor styles. With its easy installation and low upkeep requirements, this vanity light will not disappoint. Arden offers a comfortable silhouette that is both rustic and modern. A substantial frame is crafted from overscale tubing to heighten the effect. Fixtures feature either etched glass or a summer linen fabric shade that coordinate well with other Progress Lighting styles, such as Cherish. 3-Light Brushed Nickel Vanity with Chisel Glass - 5.6 inch This vanity light will update your home with its eye-catching design. Featuring a brushed nickel finish and chisel shade(s), this fixture will accommodate a variety of dicor styles. With its easy installation and low upkeep requirements, this vanity light will not disappoint.